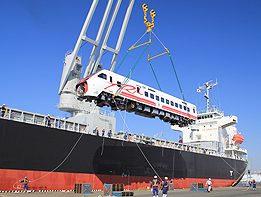 As a partner for steamship lines, we do everything necessary for the vessel calling the Port of Nagoya. Stevedoring (loading and unloading the cargo for container vessel, conventional vessel, and car carrying vessel) is the most important duty, however, any related procedures involving customs and immigration office for the vessel traveling county to country is another duty of ours. 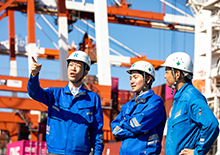 We are the biggest port operator in the Port of Nagoya, where the biggest amount of export trade has been recorded among Japanese ports. Needless to say, the safety is the biggest concern for the port operation. In order to keep improving the operation quality and safety, we prepared the operation manual and became ISO9001 certified in 1998. Since then, we have kept improving customer satisfaction through Kaizen activity. We are facing a lot of unpredictable happening in the port operation. 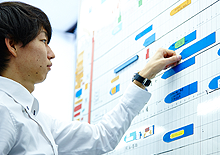 We have been able to adjust our labor force to meet the sudden change of operation plan. With the sufficient number of educated employee, we are flexibly managing our customers’ needs. The centralized management of information system is essential for the faster, smoother, and more productive port operation. 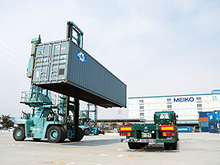 We have worked with other port operators for the development of the unified computer system to be used for the entire container terminal operation in the Port of Nagoya. This kind of cooperation among the port operators is unique and we are continuously taking initiative for improvement and maintenance of the IT system for the efficient operation.